This week, Oct 10 to 14 2018, Kati of Terra Book 1 is free on Amazon. In saving her small son from alien abductors, a 24-year-old Earth woman, Katie, finds herself abducted instead. She awakens from a drug-induced coma on a spaceship, in a room full of children, both human and alien, and two other women, younger than she is. The young women adapt to the situation as best they can, keeping the youngsters calm and entertained. But, when a drugged alien man wearing a uniform is added to the captive cargo, it becomes clear that this is an intergalactic slave operation. The slave traders implant their captives with “translation nodes” in order to allow communication among various groups. These are living entities, normally docile, merely enhancing certain brain functions, such as language acquisition. However, Katie discovers that she has accidentally received a very special “granda node”, a long-lived node with its own cantankerous personality, including a fondness for criminality and lethal weaponry. Fortunately for Katie, it also values its freedom. With its help, she escapes on a fringe planet, dragging the peace officer along—also at the granda’s suggestion. She finds herself on a strange world, with a somewhat deranged personality, quite possibly a killer, in her head, and partnered with a man from an advanced civilization who abhors killing. He is a Federation Peace Officer, captured by the slavers while attempting to bring them to justice. His task is complicated by the fact that he has sworn to avoid the taking of sentient life during the performance of his duties. He can and does, however, make vigorous use of non-lethal weaponry. Since, before leaving the ship, Katie had promised to help her co-captives gain their liberty, she and the alien peace officer find that they have a common cause. But first they must find their way off the primitive planet and get to the Federated Civilization, avoiding the slavers who have been left on the planet to re-capture them. Their flight is complicated by the fact that the planet has had a global warming catastrophe some centuries back – the locals refer to it as the Drowned World. This has forced the inhabitants to revert to a pre-industrial state of development; however, they are a wily and resourceful people, mostly helpful, but they can also be dangerous. Kati (to mark her escape, she adopts a slight name change) and Mikal seek a Federation beacon, which had been hidden on this planet ages ago, to aid in situations such as this, (in accord with a longstanding Federation policy for fringe worlds). They must embark on an arduous trek across two continents and an ocean, seeking the temple that holds the beacon. They travel on foot, by cart, by riverboat, by tall sailing ship, and on pack animals, always pursued by the dangerous slavers. They must rely on their wits, guile, charm and acting abilities to avoid recapture, while their chasers have advanced technology and ruthlessness on their side. Fortunately, they are able to make many friends who help them along the way, and their quest becomes a series of adventures, both frightening and funny, and involving a cast of engaging characters. To complicate matters, Kati finds herself falling in love with Mikal, the strange, handsome and amusing alien. He seems to be reciprocating, though they both struggle against an untimely romantic entanglement. 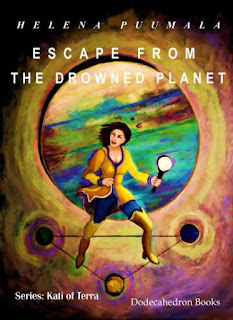 Will Kati and Mikal escape from the Drowned Planet? Can they ultimately bring the slavers to justice, as Mikal has sworn to do? Can they free the remaining captives of the slavers, as Kati has promised to do? Read this book and the rest of the series to find out all. At about 200,000 words (equivalent to a paperback of about 400 pages), the book is an excellent value.